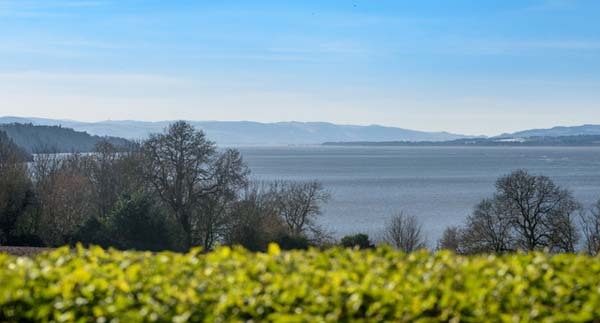 Auchenblae occupies a prime site in the picturesque hamlet of Kirkton of Balmerino with panoramic views over the River Tay to the Sidlaw hills beyond. It is the perfect place to sit back, relax and leave all the stresses of everyday life behind. 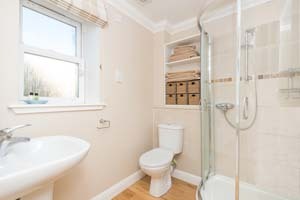 The cottage is very centrally located for touring Scotland, being only a few miles from the main motorway network, making both Edinburgh and Glasgow readily accessible. Closer to home are the picturesque fishing villages of the East Neuk of Fife, full of whitewashed cottages with red pantiled roofs, crow-stepped gables, and cobbled streets leading to secluded little fishing harbours. In the summer months, these villages host festivals of art, crafts, music, theatre - you'll be spoilt for choice! The medieval university town of St Andrews with its city walls, castle and cathedral ruins has much to offer. It boasts beautiful sandy beaches in addition to a wide range of shops, restaurants, theatre, cinema and leisure centre. St Andrews is most renowned for golf: it is many a golfer's ambition to play The Old Course, however, there are numerous golfing venues to choose from as well as lots of other golf courses nearby. Dundee is only a twenty minute drive from the cottage. The waterfront area has been extensively remodelled and now boasts the new, iconic V&A museum. Well worth a visit as is the RRS Discovery, built in Dundee to take Captain Scott to Antarctica. The ship is berthed at Discovery Point right next to the V&A and is part of an award winning visitor attraction. The cottage is an ideal location for walkers and cyclists too with miles of quiet routes to explore. There is a riding school around 9 miles away in the middle of Tentsmuir Forest, offering miles of forest and beach riding. Obviously being on the banks of the Tay and close to many beaches means there are plenty of opportunities to indulge in water sports - sailing, canoeing, water ski-ing and windsurfing being the most popular. Head down to Elie in the East Neuk for a great range of water based activities. Auchenblae has been stunningly renovated. 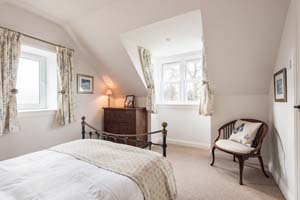 The accommodation is over two floors, with entrance hallway, sitting room with an open fire and comfortable furniture, kitchen equipped with everything you'll need, one gorgeous twin bedroom and shower room downstairs and two lovely double bedrooms upstairs - one of which has an en-suite bathroom. 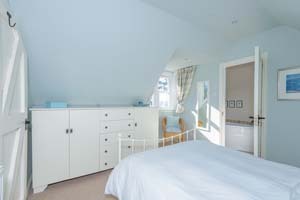 The beds are extremely comfortable and the rooms are beautifully appointed. 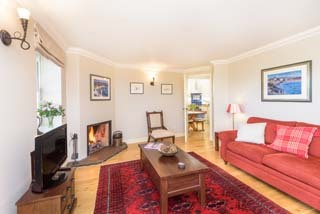 The atmosphere in Auchenblae is warm and cosy, with oak flooring and Persian rugs throughout the ground floor. The dining kitchen has a vaulted ceiling with skylights, which flood the area with natural light. 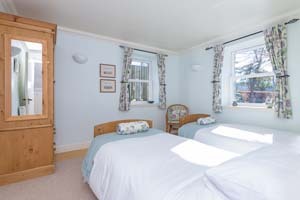 All rooms look out over the gardens and have views of the river. Relax in front of the open fire after a day exploring or in the garden admiring the amazing views - this is a superb self-catering house! Coming from the south, Kirkton of Balmerino is around 22 miles from the M90 motorway. Come off the M90 at Junction 8, taking the A91 towards St Andrews. At the roundabout, go left onto the A92 towards Dundee. After approximately 7.5 miles, turn left towards Balmerino. At the last T junction turn right towards Kirkton of Balmerino. Electricity, towels and bed linen. Starter pack of logs for the fire. The cottage also contains staples such as salt, pepper, spices, olive oil, tea, coffee and all cleaning/laundry materials. 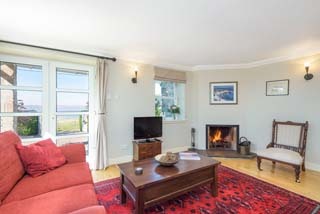 This delightful Fife holiday cottage is rented out year round. Change over day is Friday, 4pm check-in and 10am check-out. 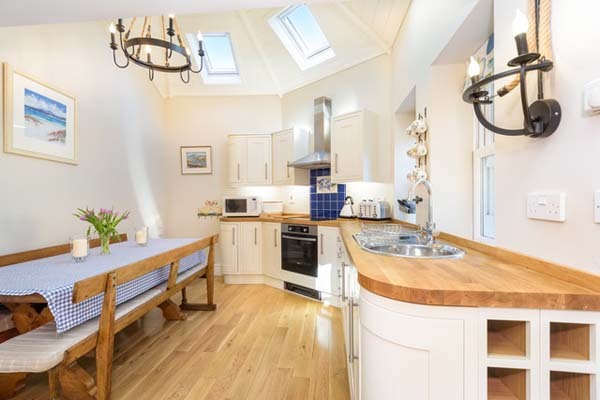 To book this stunning self-catering cottage near St Andrews, click the enquiry button below and see availability and rental rates. 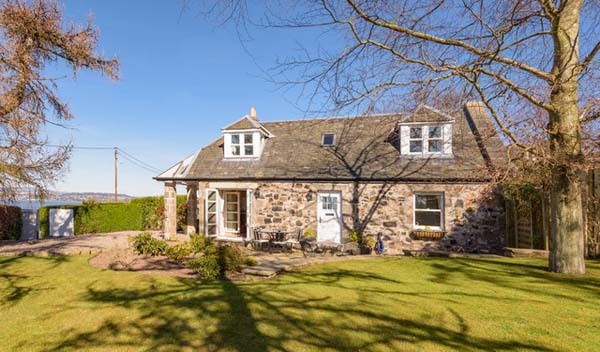 This idyllic Fife cottage is perfect for golf, walking, cycling, beaches and generally relaxing and getting away from it all. 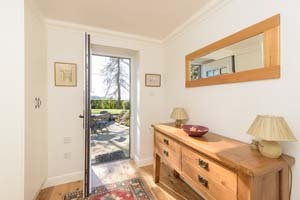 Self-catering near St Andrews gives you an opportunity to explore the beautiful Fife coast, pretty villages, castles and gardens - as well as being within easy reach for a day trip to Dundee, Edinburgh or Glasgow.